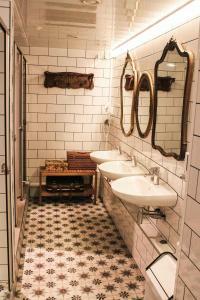 Pars Teatro Hostel is located just 5 minutes’ walk from Barcelona’s port and the famous Ramblas. It offers a 24-hour reception and air-conditioned dormitories with free WiFi and individual lockers. Pars Teatro Hostel organises sangría nights, pub crawls and group dinners. There is a modern kitchen where you can prepare your own meals, and there is also a common room with a TV, music, games and vending machines. 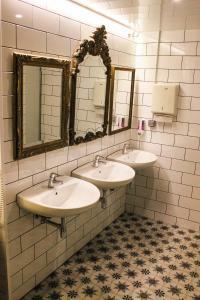 El Raval district and La Sala Apolo nightclub and concert venue are within 5 minutes’ walk of the hostel. You can walk to Parallel Metro Station in 5 minutes and Plaza Espanya is 2 stops away. The multilingual staff can provide information on Barcelona 24 hours a day. Please note that for stays of 1 night only, a supplement of € 2 for bed linen will be applied. Please note, when booking for more than 5 people, different policies and additional charges may apply. Please inform Pars Teatro Youth Hostel in advance of your expected arrival time. You can use the Special Requests box when booking, or contact the property directly with the contact details provided in your confirmation. Guests are required to show a photo identification and credit card upon check-in. Please note that all Special Requests are subject to availability and additional charges may apply. In the event of an early departure, the property will charge you the full amount for your stay. This property will not accommodate hen, stag or similar parties. This property is located in a residential area and guests are asked to refrain from excessive noise. This air-conditioned dormitory features free Wi-Fi, individual lockers and a shared bathroom. Rate: € 14.29 ... € 103.45; select dates below to get current rates. Rate: € 13.90 ... € 106.10; select dates below to get current rates. Rate: € 12.86 ... € 107.55; select dates below to get current rates. Rate: € 17.99 ... € 23.04; select dates below to get current rates.